Give the trick-or-treaters who come to your door on Halloween a colorful handmade bag filled with treats! Each bag will hold several pieces of candy, two cookies, some caramel corn, or a small toy. 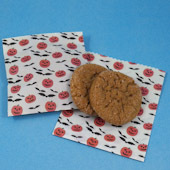 They are great for Halloween party favors, too! This is a fun and easy Halloween project that is excellent for family or classroom craft time. To make enough bags for all of your trick-or-treaters, set up a production line that involves the whole family! Related craft: Make large bags with handles to collect your treats as you go from door to door. 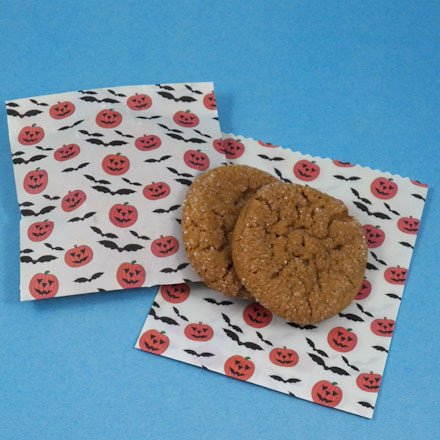 See how to make them in Aunt Annie's Trick or Treat Bags craft project. Read through the project and gather the materials needed for creating the treat bags. If you are doing this craft with a group, select and pre-cut the paper to make the craft go faster. 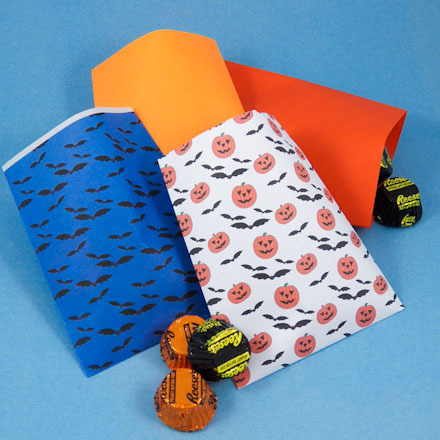 Select paper to make your treat bags—white or orange. You might print one of Aunt Annie's Halloween digital paper downloads on the white paper. 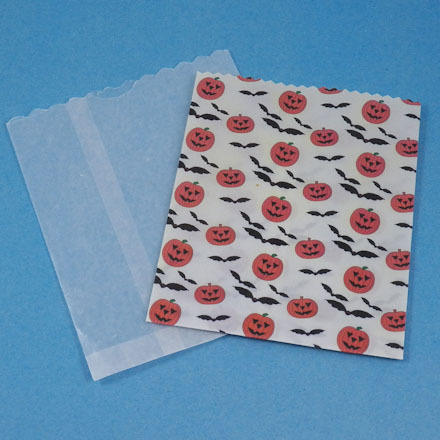 A single letter-size sheet of computer paper will make two treat bags. Tip: Bags made with paper treated with wax will keep cookies fresh and resist grease stains—see How to Wax Paper. Cut the paper in half crosswise to create two 5½" by 8½" rectangles. Cut a 4" by 6" folding form from cardstock, or use a 4" by 6" index card. Place a cut rectangle on the table horizontally. Center the folding form vertically on the rectangle. Align the bottom edges. Fold the left side of the paper over the folding form, making a sharp crease along the left edge of the form. Repeat for the right side. Remove the folding form. Glue the overlapping edges together with a line of glue. Rub along the seam to ensure a strong hold. Put your fingers under the glued seam to make sure that the seam isn't glued to the other side of the bag. Set the bag aside to let the glue dry. With the bag's seam facing up, fold the bottom ½" of the bag up. Be sure to fold both layers. Make a sharp crease. Glue both layers of the folded base in place. Let the glue dry before filling the bag. 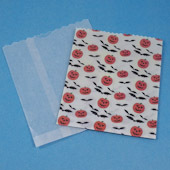 Use Halloween-themed rubber stamps or stickers to decorate plain bags. Cut the top edge of the bag with decorative edge scissors. Use a 1" circle punch to create a thumb tab in the center of the bag's top edge. Fill the bags: Put Halloween treats inside of the bags. Leave the bags open or fold the top over and seal with tape or a sticker. That's it! Your treat bags are ready for Halloween! 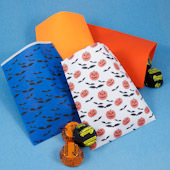 Tip: Plain or printed computer paper can be used to make Halloween treat bags. 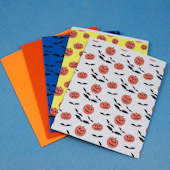 These printed bags are made with Aunt Annie's Jack-o'-lanterns on yellow, Bats on blue and Jack-o'-lanterns and bats ePapers printed on plain white paper. 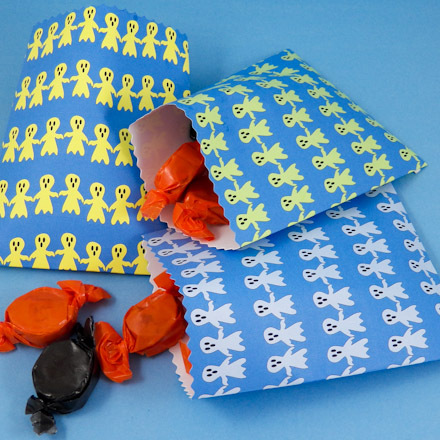 The treat bags below are made from Ghostly Ghost ePapers. Tip: The treat bags easily hold two cookies, and will keep cookies fresh when folded over and sealed. Tip: Treat bags made with waxed paper will keep cookies fresh and resist grease stains—see How to Wax Paper. 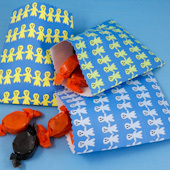 You can also make treat bags from kitchen waxed paper.